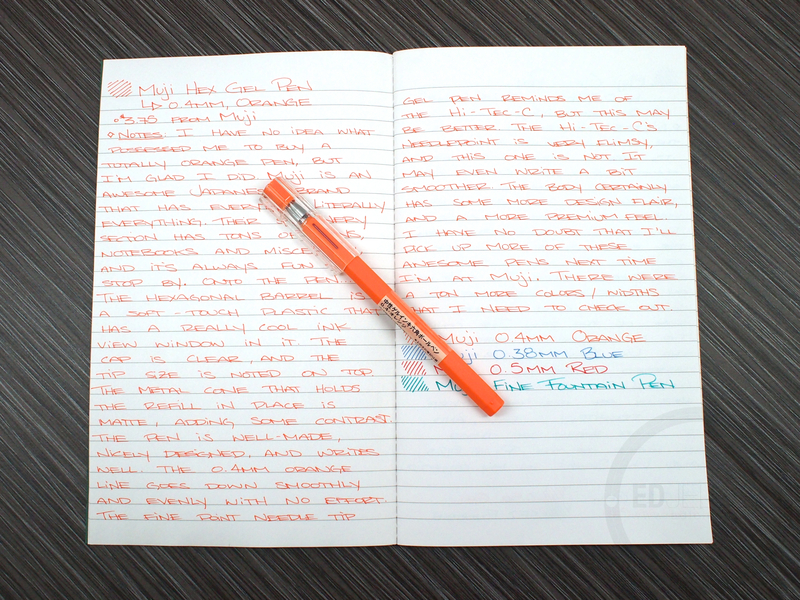 I have no idea what possessed me to buy a totally orange pen, but I’m glad I did. Muji is an awesome Japanese brand that has everything. Literally everything. I could furnish my entire house, clothe myself, and buy all the colors of gel pens and paper I want in the same store. If you happen to have one in your city, definitely check it out. Their stationery section in particular has a ton of pens, notebooks, storage, and other miscellany and I always stop in when I pass one. 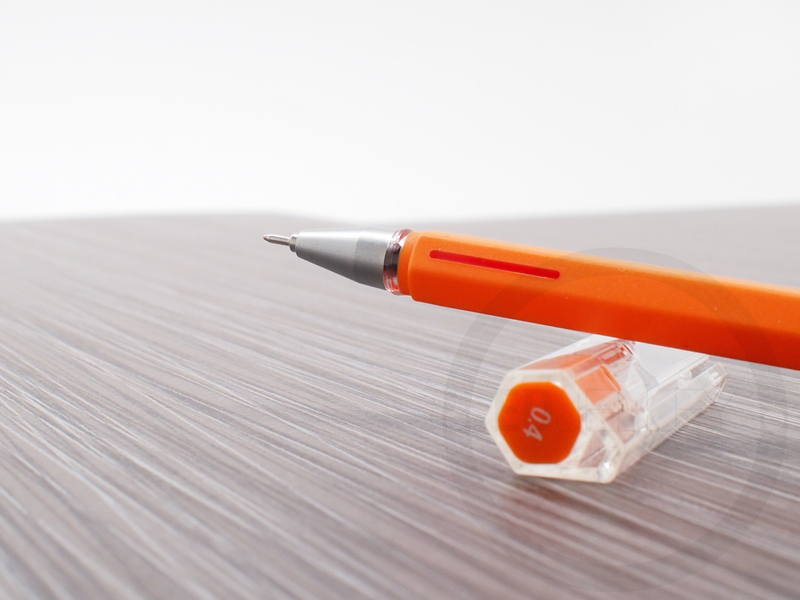 Onto the pen… The hexagonal orange barrel is a soft-touch plastic with a really cool ink-view window made of clear gloss plastic. The cap is clear and the tip size (in this case 0.4mm) is denoted on the top of the color-coordinated insert. 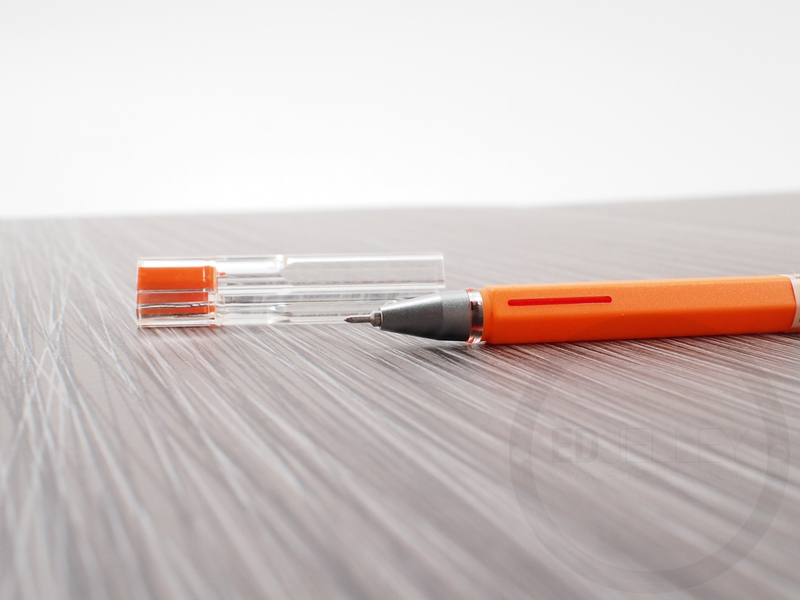 The metal cone that houses the pen tip is matte, adding some nice visual contrast to the pen. The pen is well made, nicely designed, and writes quite well. 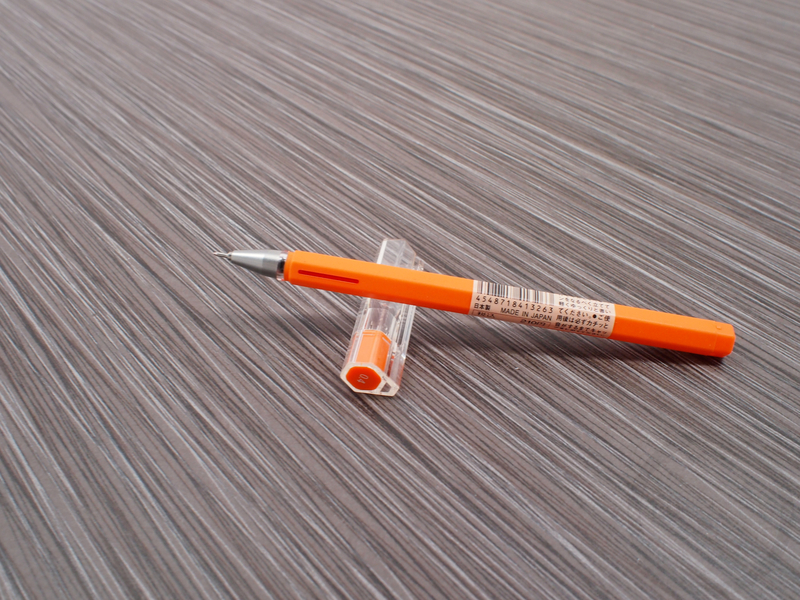 The 0.4mm orange line goes down smoothly and evenly with no effort. The fine point needle tip gel pen reminds me of the Pilot Hi-Tec-C, but this might be a bit better. I can’t help but feel that the Hi-Tec-C’s needle point is very flimsy, and the one on the Muji pen is a bit thicker. This makes it feel sturdier while writing, especially if you write with pressure. The Muji may even write a bit smoother. The body certainly has more design flair and a more premium feel, but it does come at a slightly higher price at $3.75. The pen is refillable though, with refills costing $1.50. I have no double that I’ll pick up more of these awesome pens next time I’m near a Muji store. There are also a ton more colors/widths that I need to check out. I’ll definitely give this a shot because I have a pack of the Hi-Tec-C gel pens, so I’m interested to see how this compares. Also, I was reading this review in my Feedly, and the code looked like it broke halfway through. It all seems fine here, but that was just something strange that I noticed. I subscribe to my own feed in Feedly (to make sure it comes out looking okay) and it seemed fine to me. Perhaps it was an issue with Feedly not loading the page all the way? Too bad they have been discontinued… I inquired with MUJI and they did not answer me as to why they were discontinuing such an amazing product. What a shame! I really liked mine, at least I got my hands on a few before they were discontinued. This is my go to pen! And I just found out too that it was discountinued!! Does anyone have a recommendation for a replacement? Price and look aren’t too important to me. Mainly similarity to the muji is my main concern. I draw for a living and and have gotten very attached. Hey everyone, this pen’s ink/refills are actually made by Pentel, another Japanese stationery company. Therefore, this Muji hexagonal pen shares the same tip, ink, and writing experience as the Pentel Hybrid Technica and Pentel Slicci line of pens, just choose the corresponding pen tip size. I currently have both pens in front of me and can attest there pens are identical, apart from the outer housing. Thanks for the info, John!